Having a college savings plan is important. A college degree makes a big lifetime impact. Most likely, you have a child in your life whose future will include a college education. If so, you probably are part of the 92% of parents who strongly value higher education and who believe that college is an investment in their child's future.1 Why is a college education so important? Whether your child attends a four-year, two-year or technical college, students learn important communication skills, expand their knowledge and open doors to countless opportunities. Plus, college degrees can improve earnings and help safeguard jobs. According to the Bureau of Labor Statistics, the unemployment rate of those with only a high school diploma is 5.2% in 2016 compared to just 2.7% for those with a bachelor's degree.2 And more and more employers are now requiring a college degree. As you can see below the average annual earnings for someone with a bachelor's degree is 67% higher than those with a high school degree. 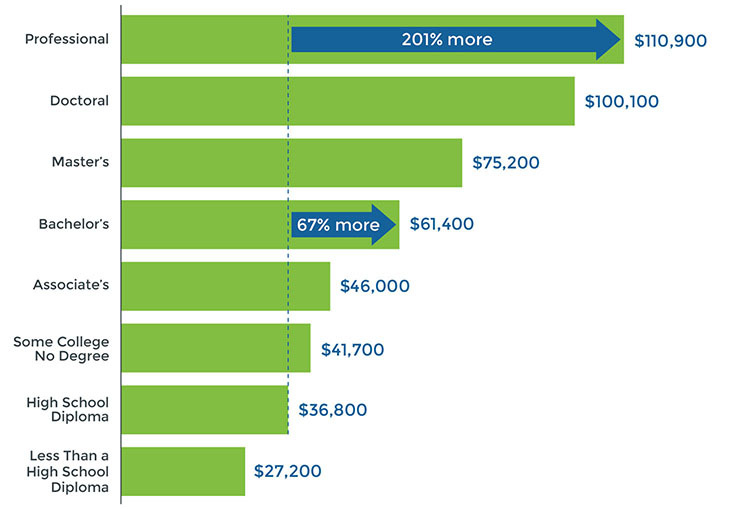 Over a lifetime, those with a Bachelor's degree earn $1 million more than those with a high school degree.